Dozens of school students suffocated on Monday morning during the clashes that broke out at the checkpoint of Shu’fat refugee camp. The Jerusalemite activist, Thaer Fasfoos, said that an Israeli force was stationed at the checkpoint since the early morning. When the students tried to pass through as usual, the forces refused until each one showed them his birth certificate; note that are aged between 12 and 15 years. He added that the forces detained the students and refused to let them go through to their school which led to the breakout of clashes where the forces deliberately fired gas and bomb grenades towards the students which led to the suffocation of many students. The forces also chased some of the students and assaulted and beat them using their batons. Wadi Hilweh Information Center was informed that a 10-year old child was injured with a rubber bullet in his leg. The Israeli army has promoted an Israeli officer who ordered the shooting of Palestinians and international activists during a Separation Wall protest in the West Bank. (Al Ray) Hebrew newspaper Maariv said, in its Monday issue, that the officer has been upgraded to Brigadier General after he ordered the firing on protesters Feb. 26, 2003, near the Separation Wall in the northern occupied West Bank. According to the newspaper, Israeli soldiers carried out the order after getting the permission from the officer, injuring both a Jewish and an American protester. Following the incident, the officer, along with two soldiers, appeared before a military court, which held him responsible for the firing, the Israeli publication said. However, the military prosecutor did not convict him, so as not to hinder his future promotion. A military spokesman commented on the promotion, saying that they scrutinized the circumstances of the incident and found that nothing could keep the condemned officer from the new position. 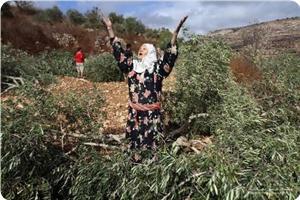 Jewish settlers destroyed 150 olive trees in a Bethlehem village and assaulted an old Palestinian shepherd near Nablus at noon Monday. Ahmed Salah, the coordinator of the popular anti-settlement activity in Al-Khader village, near Bethlehem, said that the settlers uprooted and destroyed more than 150 olive trees in the village. He said that settlers repeatedly attack the land of the farmer Yassin Dadu, adding that more olive trees had been previously damaged in his land. Meanwhile, eyewitnesses told the PIC reporter that seven Jewish settlers from Itamar settlement attacked 65-year-old shepherd Radi Hanani while rearing his flock of sheep to the east of Beit Furik village, to the south east of Nablus city. They said that the shepherd was severely beaten in the incident, adding that the settlers have been attacking shepherds in the area for the past three days. In an important new interview, Canadian activist and journalist Eva Bartlett analyzes the last several years in Gaza under Israel’s continuing blockade, a siege which is bolstered by the Egyptian military regime. Bartlett and interviewer Justin Podur compare notes on entering Gaza and analyze the impact of Egypt’s military coup on the humanitarian situation, including the ability of Palestinians to travel through the Rafah crossing and the destruction of supply tunnels. “It’s virtually a complete lock-down by Egypt and by Israel, and even the tunnels now are inaccessible,” Bartlett remarks. materials with which to repair that infrastructure, like sewage treatment plants. She also analyzes the impact of the siege and military attacks on the economic viability of the Gaza export industry, and talks about the “psychological warfare” of the constant Israeli drone presence over Gaza’s skies. Some of Bartlett’s photos are included in this video, showing attacks on fishing boats and agriculture, as well as daily life in Gaza, as part of a presentation she is currently giving on tour in the US and Canada. For more information on Bartlett’s tour, you can visit her website. The Ossington Circle is a new interview show broadcasting out of Toronto, Canada, offering a progressive, thoughtful and informed take on international politics. Host Justin Podur is a writer on international politics and analysis, and the author of Haiti’s New Dictatorship: The Coup, the Earthquake and the UN Occupation. Recent episodes have featured architect Suzy Harris-Brandts with Decolonizing Architecture and Middle East journalist and analyst Jon Elmer. 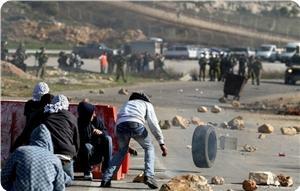 Israeli forces on Monday shot and injured a Palestinian man during clashes near Bethlehem, locals said. Dozens of Palestinians in Fawar refugee camp clashed with invading Israeli occupation forces (IOF) on Monday for the second day in a row. Eyewitnesses told the PIC that the soldiers set up a roadblock at the entrance to the camp and maltreated passing citizens, which triggered the confrontations. They said that the soldiers used teargas and sound bombs to disperse the angry inhabitants and went inside the camp, which heightened tensions and clashes. The witnesses said that the soldiers closed nearby roads including the nearby entrance to Dura town. They recalled that 20 citizens were treated for breathing problems on Sunday and many others suffered from the teargas inhalation today. 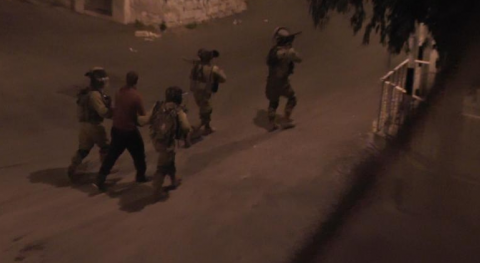 Meanwhile, local sources said that IOF soldiers rounded up three citizens in the city of Al-Khalil on Monday after breaking into homes in various suburbs. The streets of central Hebron filled with protesters on Friday afternoon as around 2,000 Palestinian and international activists marked the 20th anniversary of the Ibrahimi mosque massacre. Protesters marched through the southern West Bank city calling for the re-opening of Shuhada Street, a major thoroughfare that was closed by Israeli forces in the wake of the 1994 killing of 29 Palestinian worshipers by an armed Jewish extremist. Demonstrators were met with violence by Israeli soldiers, who maintain a heavy presence in Hebron's Old City near areas where around 500 Jewish settlers have taken over properties. Shuhada street, but Israeli forces began firing stun grenades and tear gas canisters at demonstrators as they reached Bab al-Baladiya area, organizers said. Shuhada street was once a major thoroughfare in central Hebron, but after the 1994 massacre Israeli forces shut it to Palestinian traffic under the pretext of preventing reprisal attacks against settlers in the city. The street was never again reopened. According to Israeli human rights group B'Tselem, by 2007 over 40 percent of the area's Palestinian homes had been abandoned and three-quarters of commercial establishments had shut down to the severe difficulties they faced as a result of the street closure and checkpoints. An activist campaign to "Open Shuhada Street" is now in its fifth year, but Israeli authorities have so far refused to do so. 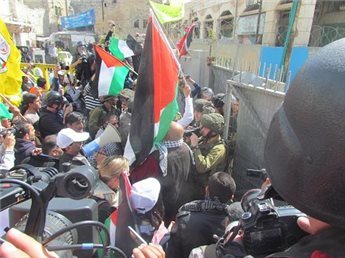 Clashes broke out following the protests, turning Hebron's center into a battleground for hours on Friday afternoon. Coordinator for the activist group Youths against Settlements Issa Amro said that Israeli forces chased protesters into the Bab al-Zawya neighborhood and fired rubber-coated steel bullets, injuring 13. Five other protesters were detained by Israeli forces over the course of the clashes, including Badee al-Dweik, Tamer al-Atrash, Mohammad Zughayyer, Farid al-Atrash, and Issa Amro himself. The streets of central Hebron filled with protesters, on Friday afternoon, as around 2,000 Palestinian and international activists marked the 20th anniversary of the Ibrahimi mosque massacre. Protesters marched through the southern West Bank city calling for the re-opening of Shuhada Street, a major thoroughfare that was closed by Israeli forces in the wake of the 1994 killing of 29 Palestinian worshipers by an armed assailant. Prime Minister in Gaza Ismail Haniyeh Sunday said the Israeli occupation is flouting the international law with the targeting of unarmed civilians. 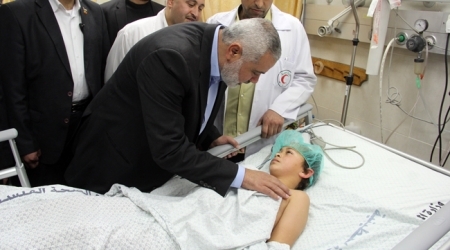 Haniyeh’s comment came during his visit to Ahmed Helles, a 12-year-old Palestinian who sustained a serious injury in the head in Friday’s border protest of Israel’s buffer zone in east Jabalyia, northern the Gaza Strip. He commended the medical crews’ dealing with Helles who was transferred to hospital in a serious health condition, wishing him and all of the injured a speedy recovery. Sixteen Palestinians were wounded by Israeli army gunfire Friday in two separate incidents near the border fence in the Gaza Strip. Medical sources reported that Ahmed Helles was hit by a tear gas canister straight in the head, which left him in a serious condition. Six Palestinians in Gaza have been killed and one Israeli since late December. 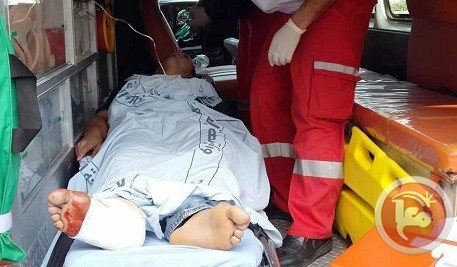 A number of Palestinian citizens were wounded in an Israeli military incursion into Fawar refugee camp, south of Al-Khalil, on Sunday morning. Local sources said that violent confrontations erupted in the camp after Israeli occupation forces (IOF) fired metal bullets and teargas bombs on houses and citizens. They said that young men clashed with the invading troops and threw them with stones and empty bottles while the soldiers deployed in nearby fields. Six Palestinian citizens were injured during violent clashes that erupted between hundreds of youths and Israeli forces in front of the Jalazoun refugee camp, north of Ramallah, on Friday afternoon. Hundreds of youths headed towards the settlement of Beit El, to protest the killing of a citizen from the camp last month, and threw stones and empty bottles at the Israeli soldiers and settlers. PIC's correspondent said that during the confrontations, Israeli snipers fired rubber bullets at the protesters, injuring a number of young men. Dozens of Palestinians also suffered suffocation, when the border guards intervened and fired tear gas grenades to disperse the demonstrators. 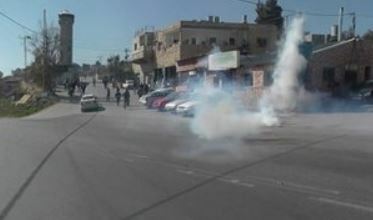 Meanwhile, three demonstrators were injured in the town of Silwad east of Ramallah, during violent clashes that broke out west of the town on Friday afternoon. Eyewitnesses told PIC's correspondent that one of the protesters was hit in the head with a metal bullet and that he was transferred to hospital in serious condition. They added that Israeli forces stormed the town from the west, and stationed near the Shuhada roundabout, near the camp of Silwad. 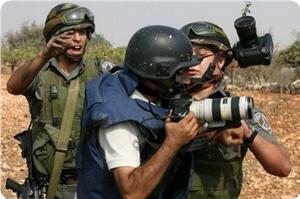 The Palestinian Journalists' Syndicate (PJS) condemned the Israeli serious escalation against journalists while covering events in Palestinian occupied territories. PJS' statement strongly condemned Israeli brutal attack on the journalist Abdul Ghani Natsheh, Pal Media's cameraman, who was shot in his face with a rubber bullet from a distance not exceeding 10 meters. 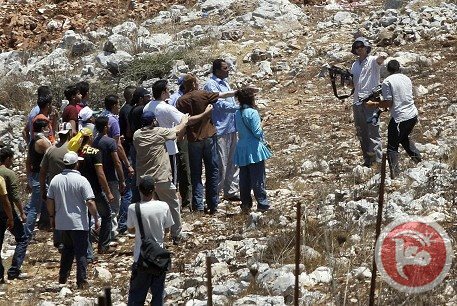 Israeli attack on a group of journalists including Natsheh and his two colleagues Louay Grave and Firas Lutfi Nahar came as part of Israeli authority's systematic policy to cover its daily crimes and violations against Palestinian people, according to the statement. The syndicate called upon international community to prosecute and pressure Israeli authorities for halting the ongoing crimes, reminding that 2014 is the year of exposing Israeli violations against journalists. For its part, the Palestinian Media Forum also condemned the Israeli continued Israeli targeting to Palestinian journalists while exercising their profession in covering Israeli violations in occupied West Bank. The forum aid that Israeli violations against journalists have been noticeably escalated most recently was the attack on cameraman Natsheh and his two colleagues. The forum called on international community to put an end to Israeli violations to international conventions and laws. As dozens of Palestinians marched in Hebron, in the southern part of the occupied West Bank, marched marking the 20th anniversary of the Ibrahimi Mosque massacre, and demanding Israel to open the Shuhada Street, closed since then, Israeli soldiers violently attacked them injuring 15, while dozens suffered the effects of tear gas inhalation. He said the protesters marched in commemoration of the Ibrahimi Mosque Massacre in 1994, and to demand the army to reopen the Shuhada Street, a major road closed by the Israel since then. Palestinian Legislator, secretary-general of the Palestinian National Initiative, Dr. Mustafa Barghouthi, and Hebron Governor Kamil Hmeid participated in the protest. 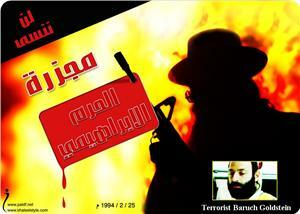 On February 25 1994, an American-born fanatic Israeli physician, a settler identified as Baruch Kopel Goldstein infiltrated the Ibrahimi Mosque in Hebron, during dawn prayers, and fired dozens of rounds of live ammunition at the worshipers, killing 29 and wounding at least 150, before they managed to kill him. The massacre led to clashes in every part of the occupied West Bank, Gaza Strip and occupied East Jerusalem, leading to dozens of casualties among the Palestinians. 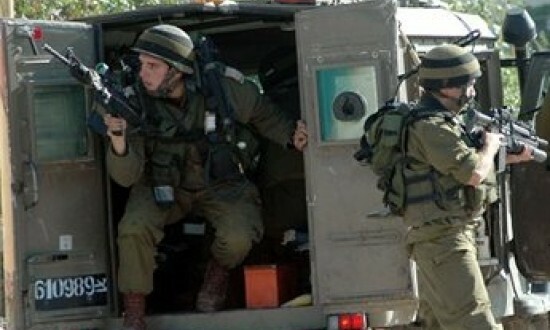 Palestinian medical sources have reported, on Friday evening [February 21, 2014] that several Palestinians have been injured, and one have been kidnapped, after Israeli soldiers invaded the Safa area, north of Beit Ummar town, near the southern West Bank city of Hebron. Medical sources said that dozens of residents suffered the effects of teargas inhalation during clashes with Israeli soldiers invading the Safa area, the Maan News Agency has reported. Local sources have reported that dozens of local youths hurled stones at the invading soldiers, and that the army fired rubber-coated metal bullets and gas bombs. On Friday afternoon, soldiers kidnapped Sakher Hisham Abu Mariya, 23 years of age, and took him to an unknown destination. He was driving his car, used for public transportation, when the soldiers kidnapped him. This is not the first time the soldiers kidnap Abu Mariya, as he was repeatedly kidnapping and imprisoned by the army, and has two brothers, Habes and Jihad, who are still imprisoned after being kidnapped several months ago. His brothers previously spent years in Israeli military prisons and detention camps. 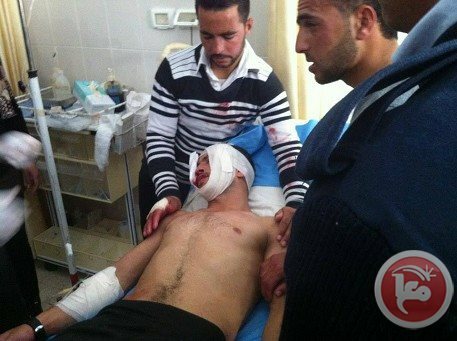 A Palestinian man was injured on Friday during clashes in the Bethlehem-area village of Tuqu. 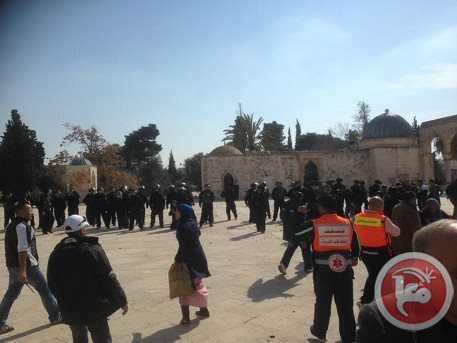 Israeli police on Friday afternoon detained six Palestinians from Jerusalem as they exited al-Aqsa mosque in East Jerusalem, following protests in the compound against an Israeli politician's visit. The Director of the Prisoners' Society in Hebron Nasser Qaws said that Israeli forces detained Ahmad Badreya, Salah Sharifah, Ahmad al-Razim, and three others who had yet to be identified. During the clashes, witnesses said that youths destroyed the camera of the Israeli police station located in the al-Aqsa compound, and threw stones at Israeli forces near the Moroccan gate in protest against visit of Israeli MK Moshe Feiglin to the holy compound. Israeli police spokesman Micky Rosenfeld said that the youths were "involved in disturbances" and "threw stones at police officers" following Friday prayers. It is also venerated as Judaism's most holy place as it sits above the site where Jews believe the First and Second Temples once stood. Dozens of Israeli soldiers invaded the Deheishe refugee camp, south of the West Bank city of Bethlehem, clashing with dozens of local youth and causing several injuries. Local sources said that the army invaded the camp to deliver notices to two of the youths, ordering them to head to a nearby military base for interrogation. The invasion led to clashes with local youth who threw stones and empty bottles at them, while the soldiers fired gas bombs, concussion grenades, rubber-coated metal bullets and several rounds of live ammunition. Medical sources said several residents suffered the effects of tear gas inhalation, and received treatment by local medics. The soldiers served Younis az-Zaghary and Ayman Mheisin with military warrants ordering them to head to the Etzion security and military base, to the south of Bethlehem, for interrogation. In related news, soldiers invaded the Fahma village and Ya’bad town, near the northern West Bank city of Jenin, broke into and violently searched several homes. Local sources said that the soldiers took pictures of the exterior and interior of the invaded homes in Fahma village, and withdrew later on. The soldiers also invaded Ya’bad town, firing concussion grenades and installing a military roadblock at its main entrance. Sixteen Palestinians were wounded by Israeli army gunfire Friday in two separate incidents near the border fence in the Gaza Strip, Palestinian medical sources said. Ashraf al-Qudra, a spokesman for the health ministry, said a 12-year-old boy was in serious condition after being shot in the head northeast of Gaza City near Jabalia. Thirteen other Palestinians who had been throwing stones at Israeli soldiers were also wounded when the troops opened fire at them, he added. In the other incident a Palestinian boy, also aged 12, was seriously wounded by Israeli gunfire near the Sufa crossing east of Rafah in southern Gaza, Qudra told AFP. Friday's escalation comes amid Israeli threats directed to Gaza-governming Hamas with a full-scale offensive, while the later says it's committed to maintaining Egypt-mediated cease-fire agreement which followed an eight-day aggression that led to 167 Palestinians mostly civilians killed. 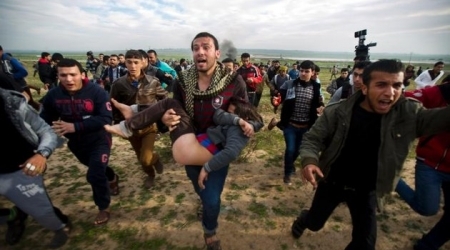 Thirteen people were injured, Friday, after Israeli forces opened fire on Palestinian demonstrators east of Jabaliya, in the northern Gaza Strip. Dozens of others suffered from excessive tear gas inhalation as Israeli forces violently dispersed the group, which was protesting against the confiscation of lands near the border by Israeli authorities. Ashraf al-Qidra, spokesman for the Gaza Strip Ministry of Health told Ma'an News Agency that 13 people were injured, including a 12-year-old child who was seriously injured. They were all taken to Kamal Adwan Hospital in Beit Lahia. Israeli forces frequently shoot at farmers and other civilians, inside the Gaza Strip, who approach the large swathes of land near the border which the Israeli military has deemed off-limits to Palestinians. The Israeli occupation forces (IOF) violently attacked on Friday afternoon peaceful Palestinian protestors in Al-Khalil city marking the 19th anniversary of the massacre of the Ibrahimi Mosque. The protestors also demanded the Israeli occupation authority to reopen Al-Shuhada'a street, which has been closed since 1994 in the wake of the massacre. The IOF fired a hail of tear gas grenades and rubber bullets randomly to disperse the Palestinian rally and physically attacked several demonstrators. Several injuries took place. Israeli soldiers detained Ibrahim Al-Heih after beating him and a family of eight members was rushed to hospital after two tear gas canisters fell into their apartment, according to eyewitnesses. 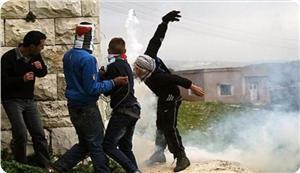 A tear gas grenade also exploded inside a home in the Jabal Juhar area, injuring several family members. The Ibrahimi Mosque massacre was a shooting attack carried out by American-born Jewish settler Baruch Goldstein, a member of the extremist Israeli Kach movement, who opened fire on unarmed Palestinian Muslims praying inside the Mosque on February 25, 1994. 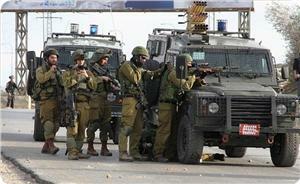 Israeli forces raided on Friday the two villages of Fahmeh and Yabud in Jenin province. 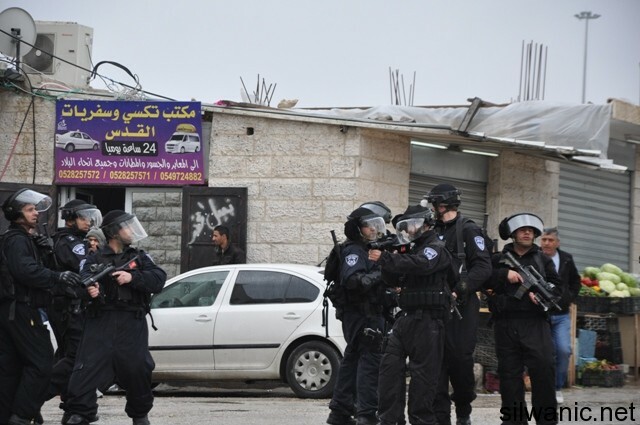 Security sources said that Israeli forces raided the village of Fahmeh south of Jenin and broke into several houses. The forces also raided Yabud village amid sound bombs shooting, and set a military checkpoint at the main entrance of the village. The Israeli occupation forces (IOF) stormed early Friday the village of Fahma south of Jenin city, to the north of the occupied West Bank, and took photos of the houses. Local sources told the Palestinian information center (PIC) that seven military vehicles raided the town and stationed near its main mosque, and then started to take photos of the area. The sources added that the IOF soldiers questioned a number of citizens during the raid and erected checkpoints at the town's entrances for hours. A young Palestinian was injured by Israeli forces on Friday morning east of Jabaliya refugee camp in the northern Gaza Strip, medics said. Israeli soldiers continued their assault against the Nabi Saleh village, near the central West Bank city of Ramallah, for the tenth consecutive day, firing rounds of live ammunition, gas bombs, and rubber-coated metal bullets, leading to dozens of injuries, and excessive property damage. 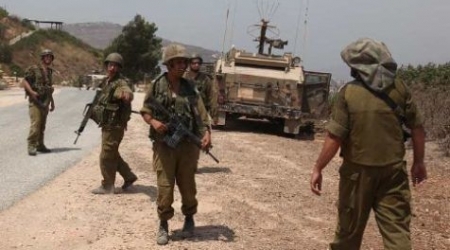 Local sources have reported that dozens of soldiers invaded the village, on Thursday evening, and that dozens of Palestinians have been treated for the effects of tear gas inhalation, while several children suffered anxiety attacks. Clashes took place between the invading soldiers and local youths who hurled stones and empty bottles at them. The Popular Resistance Committee in the village said the invasion is part of an assault, initiated by the army ten days ago, and part of Israel’s ongoing violations and attempts to end the ongoing popular resistance against the Annexation Wall and illegal settlements. Six Palestinians were injured in clashes after Israeli settlers attacked a high school south of Nablus on Thursday, according to a Palestinian Authority official. Ghassan Daghlas, a PA official who monitors settlement activity in the northern West Bank, said that clashes broke out after Israeli settlers attacked Burin High School. 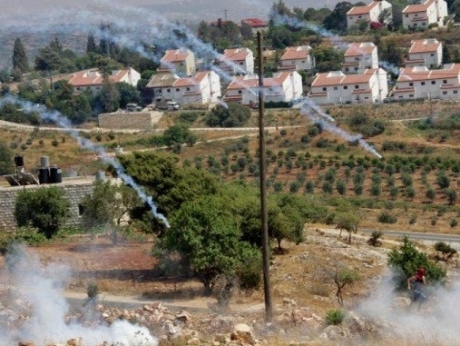 The attack led to the subsequent intervention of dozens of villagers and Israeli forces, who fired tear gas during the clashes. Daghlas added that dozens of Palestinian suffered from excessive tear gas inhalation, including Mohammad Thawqan, Diya Rayyan, Imad Najjar, Asim Mohammad Najjar, Walid Salim, and Ibrahim Theeb. 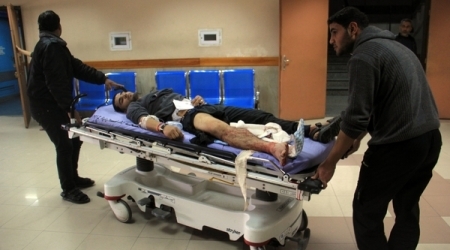 The injured were subsequently taken to Rafidia governmental hospital for treatment. An Israeli army spokeswoman said that "100 Palestinians ... began hurling rocks at soldiers" while they were engaged in "routine activity" in the area. She added that soldiers used "riot dispersal" means against the protesters. Also on Thursday afternoon, a fire bomb was thrown towards a car belonging to a settler in the area. As a result, a large number of Israeli forces arrived on scene and closed the main road temporarily. Burin is a frequent site of settler violence and Palestinian clashes with Israeli forces as it is located beside the notoriously violent Israeli settlement of Yitzhar. In the last week alone, hundreds of olive trees across the West Bank have been chopped in a number of incidents targeting Palestinian farmers' livelihoods. 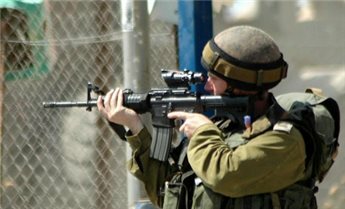 The Israeli occupation forces (IOF) on Wednesday night opened fire indiscriminately and intensively at Palestinian homes along Gaza border, with no reported casualties. Quds Press reported that after a blanket of fog started to cover the Gaza border areas at night, the Israeli soldiers in the watchtowers opened machinegun fire randomly towards the nearby homes along the perimeter fence in Gaza. It said that the intensity of the Israeli gunfire last night reflected the fears of Israeli soldiers that Palestinian resistance fighters could use the foggy weather to infiltrate into their posts and carry out special operations against them. The shooting incident caused extreme panic among the civilians in border areas, but fortunately no casualties were reported. Israeli navy boats fired rounds of live ammunition at Palestinian fishing boats, in Gaza territorial waters, and targeted a Palestinian security base close to the Palestinian-Egyptian border. The Radio Bethlehem 2000 has reported that Israeli Navy boats fired dozens of rounds of live ammunition at the security base, causing damage but no injuries. 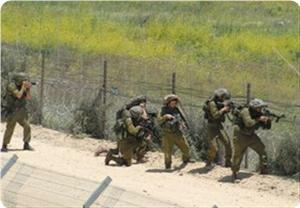 The security base was evacuated fearing additional Israeli attacks. 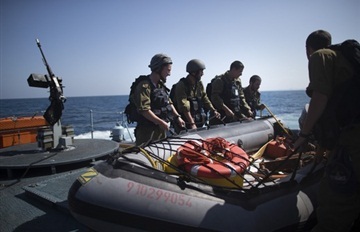 The Navy also opened fire at Palestinian fishing boats near the Rafah shore, in southern Gaza, causing damage to one boat carrying three fishermen who escaped the attack unharmed. Israeli attacks against fishermen and fishing boats in Gaza are part of ongoing Israeli violations, and military escalation, against the Palestinians in the besieged and impoverished coastal region.